Over the next few days I will be in Los Angeles participating in the 140 Conference. Created by Vonage Co-Founder and Technology Investor, Jeff Pulver. The 140Conf. aims to show the state of NOW and brings together over 140 speakers to talk about how Twitter and real-time communication is effecting all aspects of our lives. From the Police Chiefs That Tweet to Public Health to, of course Education, there is going to be some powerful conversations taking place. Check back here throughout the conference as I will be posting several updates, including where you can watch the talk on education as it happens. Introduction to Diigo Toolbar. Diigo Toolbar installed. MathSite: An Interactive Source for Seeing, Hearing, Doing Mathematics. Textbook publishers see eBooks as the future. Several major textbooks come with access to either books on CD, media cards, USB or access to their content via a website. That is wonderful! I remember having to carry around 6-7 large textbooks when I was in highschool. The thought of being able to replace 50 pounds of books with a 2 pound eBook reader is incredible. Even champions of educational technology need to take a step back every once in a while and really think about our choices and think about what we are telling people the future of education is going to look like. Again, technology needs to be in schools. Students need to use laptops and interactive whiteboards and cellphones/smartphones and other technology whenever possible. But sometimes we move too fast. We need to think about what consequences adopting technology so early will have on the future. There is a place for eBooks in the classroom. Can they replace textbooks. Heck yeah! Why not! 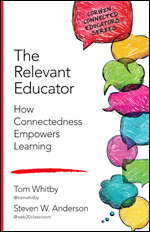 The eBook of the future could be a multimedia platform with video and audio and interactive teaching tools. But should eBooks replace entire libraries like the one in Massachusetts? I just don't think so, at least not right now. Are Parents The Obstacle To The Future Of Education? In the past you have read about the many obstacles teachers/schools face when it comes to using Social Media/Web 2.0 Tools in the classroom. Filtering, lack of professional development, and support are just a few. We are in a difficult time period here... Parents have to be taught and given access if we want to do many of the things we talk so much about. Soon enough, the students of today will be the parents of tomorrow. Technology is yet another tool. Folks are afraid of what is new and need some time to assimilate. If they are shown the value of the 'new tool', they will try to make it work in their classes too, because great teachers will do whatever they need to do to get kids to learn. The best way to educate parents about Web 2.0 is to USE it. Include it as naturally as you do in the classroom. Send surveys (such as this one) or create videos on the web and share them. Use tools such as VoiceThread, Animoto, Google Docs, Smile Box, wikis, blogs, etc so they can see and have opportunities to respond to your projects. We don't want to teach "social media" - we want to use it TO teach. Wonder if teachers talked about how to educate parents about the benefits of calculators 40 years ago? This, I see is the biggest challenge to overcome. It seems like daily we hear about a predator who uses a social network to meet an underage child; the same social network we advocate for use in the classrooms (sometimes). We hear about the latest case of cyberstalking or cyberbullying. 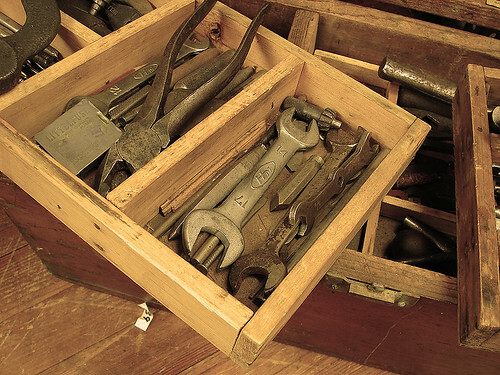 But can you think about the last time you heard about a positive use of these tools? I know the stories are out there. I have heard them. But the problem is they stay inside educational circles and hardly ever make it mainstream. So parents have this warped idea that all social networking is bad and evil. Parents are scared to let their students use the internet or have their picture appear on the web, all over the fear mongering that perpetuates the airwaves. Were parents, teachers, administrators, so resistive to change when the slide rule, calculator, overhead were introduced in school? Were they afraid that when students learned to use a calculator they wouldn't know math any more? Maybe. Social Media and Web 2.0 Tools are just that, tools. They are the devices teachers use to teach, and students use to learn. I (and many others) see them no different from the chisel and slate, ink and hide or pencil and paper. These are just the new tools. And new tools take time getting used to. Going right along with fear of use of these tools in the classroom is the lack of education on our part. I am sure there are individual schools/districts out there doing a great job of teaching their students responsible use and cybersafety. But I would guess that the vast majority of students are not regularly involved in a cybersafety curriculum on even a monthly basis. Whats worse is that when the students are learning about how to stay safe online the parents are rarely involved. Another comment that was made was about access. Parents might not understand these tools because they have not had the time/ability to investigate them at home because of access. I live/work in a very rural area of North Carolina. Everyday I hear a teacher or parent that is frustrated because where they live in an area either not served by high-speed internet access or they only thing they can get is dial-up. So because there is frustration with the technology and access at home, this is then translated, perhaps unintentionally, to the classroom. If you are a teacher who regularly uses technology in the classroom when was the last time you invited parents into your room to use it with their students? I know, most who use these tools do a great job of showing off the end result but what about from the beginning? If you create a classroom blog, do you invite your parents to also post? If you are creating Voicethreads do you have your parents come in and give them access so they can create one too? The idea here is involvement. Parents naturally fear what they don't understand. So, help them understand. Give them same access you would give a student. Bring them in, and teach them just as you would your students. If you are using Edmodo, let them in and see the discussion. If you are working in Animoto, bring them in and have them make one also. If you can't do it during your class, make the time to do it during a special open house night or meeting at your school. Even if there isn't enough time to create, at least show. More importantly, talk about the whys and the benefits. Another thing schools and districts need to do a better job of doing is education of our parents. In addition to bringing them in to show them the use and benefits of the these tools in the classroom, we need to be having frank conversations about how to keep our students safe online. If we begin to show parents that teachers and schools are doing what they can to keep students safe online at school, we might begin to break down some of barriers. We are in the business of education. Why are we leaving the parents out of the conversation? What do you think? Are parents the road block to change. What are you doing right at your school or in your classroom. What are some successes that you have had with parent buy-in? What are you going to do different? Image from Creative Commons Image Search. View the original here. We have all been there. Its the end of another term of school. You are sitting at your desk waiting for the teacher to pass out your report card. Your palms might sweat, your heart might race with anticipation. Will it be good news or will you face the wrath of your parents? All of this anxiety over some letters on a piece of paper. But what do those letters mean? Last night, during our weekly #edchat, participants discussed whether or not the traditional system of grading (A, B, C, etc) should be abolished for something else. What was so great about this conversation was that it was decisive. There were people who were clearly on one side or the other, which made for a great discussion. Most current grading methods do not support the goals of standards-based learning. To change the grading practices will require LOTS of communication with all the stakeholders. We will have to turn a ship that been sailing for a lot of years. I feel we need to evaluate the whole learner in their acquired knowledge, critical thinking skills, application of knowledge etc. If there was a way to adopt a system of standards that an entire nation/world could use - IDEAL! BUT, not likely as there are so many opinions on education and learning. Until then, each of us must do our best to create a system of assessment in our classrooms, districts that addresses the needs of each student on a daily basis. I feel that there should be a combination of the traditional grading system along with other assessments. Unfortunately the current grading system is too entrenched and it would take a very strong effort to overturn or change it. Too many colleges & universities weigh their admissions on grades and test scores. It is sad that a lot of creativity is prevented in classrooms because of the pressure to produce on standardized tests. Honestly, I'm not sure how to replace grading. Sometimes I think it's not necessarily the grading but the assessments that are the issue. Our school is experimenting a lot more with formative assessment, but already some folks are getting push back from parents. There is such an entrenched system from K-college and beyond...levels dependent upon levels that will be very difficult to change, but I believe we can. Education has become about grades instead of learning, which means a change is necessary. Movement toward more formative assessment methods is a start. This is a debate that will continue long after we are gone. It may be that we should appreciate the looseness of the grading situation since it allows us a lot of flexibility. It should be supplemented with other ways of showing your accomplishments. Don't see how you can completely get rid of grading when standardized exams are used to demonstrate competencies in fields like medicine, law etc. Will somebody please tell me the functional difference between an 80, a 76, AND A 74? You can read more of the comments here. There were a couple of themes that we talked about. One, not mentioned above is the problem with student/parent motivation. How many of you know a parent who "bribes" their child with offers of payment for good grades either in the form of money or goods? So instead of the students reward being their education, the reward is a trip to the ATM. Perhaps it is just easier to say to the child, do this work on your own and I as the parent will pay you off so I feel better about myself as a parent because you got good grades. And what happens when the student does not return good grades? Most times they are punished. So instead of figuring out why they failed they are just labeled a failure and told to do better next time so you can earn the cash. The modern/traditional grading system is so entrenched in the minds of our parents that the thought of doing anything different brings angry questions. One participant last night said they attempted to introduce more performance based, authentic assessments with no grades, just proficient or not, and the parents wanted to know why their child did not get an A. Why did it have to be "proficient?" If we are going to change grading we, as parents, have to change the way we think about how our students are learning. The other discussion I noticed was the inconsistencies in grading. The last bullet in the above list makes a great point. What is the difference between a 74 or 75? Is the A a student gets in other class the same as an A in my class? If there was ever a reason to move away from traditional grading it is this. A student can work so hard in one class and only get a C and can go to their next class, work equally as hard and get an A. Yet when another school or college/university looks at those grades they assume that, because of the C they must be lacking in knowledge or ability. We need to move to a more performance-based/portfolio based system of assessment. Students are so different. They act differently, they have different backgrounds and homes and they learn differently. Yet we continue to compare them as all the same using the grading methods we have now. Instead, lets look at individual students and differentiate our teaching and their learning. These students are producers. Let them produce and show what they know and how they know it. And instead of saying Johny you get an A but Billy you get a B for the same work, lets just say, yep you got it or nope you didn't. And if you didn't lets figure out why. What do you think. 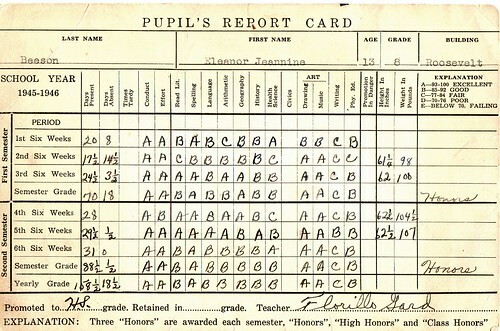 Is the system of grading we have in place now good for students and education in general. Is it working? If so, what are the benefits? If not, what needs to happen? Image from Flickr Creative Commons. View the original here. I know, I know. There are already so many tools, apps and resources you want to use in your classroom, with your kids, or for your professional development, that you just don't have time for one more. Hold that thought and read about Google Squared and you might change your mind. I wrote about Google Squared back in June when it was released by Google Labs. In a nutshell, Google Squared aims to make researching a general topic easier by providing more relevant search results. Take for example the topic of "Planets." If you were going to do a boring ol' Google Search, you might type in the name of one planet at a time. You might even get a list of planets and their attributes. Google Squared does all this for you! You enter "Planets" and you are presented with a customizable list of attributes for all 9 planets (and others) including orbital period, diameter, mass, etc. You also get a picture and a description. All information is presented in a nice looking grid. Need another attribute that isn't listed? Add a column and Google Squared will search the information for you. There are some new features in Google Squared that make it even better. One is the suggestion of attributes. Recently I was doing a Square for "Elements of the Periodic Table." While the attributes the Square returned were helpful (Symbol, Atomic Number, Mass) I need the Boiling Point and Melting Point. Scroll to the right, add the attribute "Boiling Point" and the information was immediately populated in my square. Some of the values were in Kelvin. I wanted a different value. Here is another new feature, I was able to click the attribute and search for another value, Celsius, right from the square. I could see where the information was coming from and what the new information was going to be. 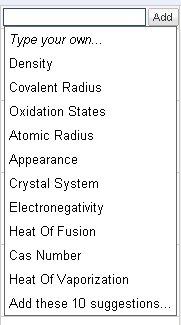 Here is a snapshot of the suggested Attributes for "Elements of the Periodic Table:"
And here is a snapshot Square I created for the Elements. Another great new feature is the ability to export your Square to a Google Spreadsheet or as a .CSV file so that you can compare data. For example, using my Elements Square, I could compare the Atomic Number to the mass and create a cool scatter plot graph to look at the correlation. Google Squared isn't perfect. I was doing a search on States and tried to add the attribute "Unemployment Rate" and it could not fill that information in for me. I could go out and search for that information and add it myself however. I don't like I can't change the size of the columns in the Square but I can when I export the data. There are some kinks but not enough to not use it. So go over and check it out. Enter some terms. Just play. Think about how you could use it for research in your classroom. Then head back here and share your ideas! At a recent workshop I was showing some teachers what a Wordle was. I used one I created from my blog as an example. If you had to explain to some one why use Wordle, what would you say? Use the hashtag #whywordle Thanks! •@colport-I use it as an assessment activity at the end of a topic, alongside concept maps from all groups in a class. •@dpeter-Visual representation. Cognitive and Concept mapping. Makes the "difficult" manageable. Shows strength of words. •@adzbutterworth-I use Wordle to summarize texts and as an interesting way to present my class with keywords. •@mrsmac75-As a starter for students to try and guess where we're going with our lesson and create their own learning outcomes. •@ktenkely-I use Wordle as warm up. I hate the question, "What are we doing today." I give word clues about what we are doing in class. Then as a class we would talk about the larger words (the words that appear most often in the text) and the no so large words (the words that do not appear as much). The possibilities are endless really. There is a really great presentation from the Ideas To Inspire website; Thirty-Eight Interesting Ways To Use Wordle, that gives some more great examples. 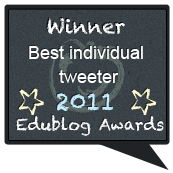 Jen Wagner (@jenwagner) created a really cool site called Guess The Wordle. Each day she posts a Wordle and student (or classes) can guess what topic they think the wordle is related to. They get progressively harder throughout the week. What a great idea as a way to start the day off each morning! How would you answer my teacher's question? What ways do you use Wordle in your classroom, or what ways have you seen others use it? 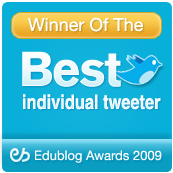 Cross Posted Over At The Digital Learning Envrionments Blog. Flash back to 1998, the year I graduated from from a small high school in coastal North Carolina. I can remember my senior year like it was yesterday. Everyone of my teachers was was using these new terms, "21st Century Learners," and "21st Century Skills." At the time I paid little attention to what it meant or was all about. I can remember a particular English Teacher who used one of those terms in just about every sentence to us. "I have to provide you '21st Century Skills' or else you won't be prepared for college or the 'real world." Being a Senior, close to graduation, I didn't really want to know or even care about, what she was talking about; I just wanted out! Moving forward to college I would hear those two terms every now and then from my professors in my liberal arts classes, before I started by degree classes. However, then I got in to my degree; Middle Grades Education. Everything we did; lesson plans, research project, lecture, everything had to relate back demonstrating how we were integrating those "21st Century Skills." We were constantly judged on how well we did or lack there off. It was drilled into our heads, so much so, I began to think if we were on the right track. After graduation I went to work in middle school teaching science. You would think by 2003 that word would have spread far and wide that we needed to be integrating these "21st Century Skills" into our teaching and we could really move on to the business at hand; educating our students. Sadly, I spent countless, wasted hours in workshops reviewing teaching methods, suggested lesson plans and watching unnecessary model lessons. What was bizarre to me was that every time we had one of these "workshops" the presenter had a different idea as to what exactly "21st Century Skills" actually were. I got the impression that there was no agreed upon list of skills. Here we are in 2009 and we are still talking about and worried about "21st Century Skills." I hate to break it to some, but we are 9 years in to the 21st Century. The conversation has yet to move past the term "21st Century." It is upon us. At this point, these are just the skills students need to have. Its not about being "globally competitive" or "prepared for jobs that don't exist yet," its about the way these kids want to be and deserve to be taught. In the U.S. the majority of these "21st Century" students are being taught with 18th Century methods. Students come in to the room, they sit down, do a worksheet and go home. They never had the opportunity to create something, or produce something or demonstrate their knowledge is any form other than a standardized test. The problem is, when they go home they get on their computer to "Facebook" a friend, while downloading music to their iPod and catching up on their favorite television show on Hulu all at the same time exploring new spots in Second Life.These are digital kids that, when they go to most of the schools in the U.S. are taught in non-digital ways. So here is what I suggest. Lets drop the "21st Century" and just focus on skills. Using that term makes it sound like what we are doing is cutting edge, new and different. To be honest. there shouldn't be anything cutting edge with what we are doing in education. When a district gives all its students laptops they should be seen as behind the times and not "leading the charge to '21st Century Skills'". When a teacher uses social media in their classroom it should be seen as "it's about time." Rather than keep talking about what skills we are talking about we need to embrace the tools and applications that students are using outside of school and bring them into our classrooms. There isn't anything "21st Century" about that. Its just what we need to be doing! The face of education is changing. It is time we as educators and a society change because it's about this kids anyway...isn't it? A teacher recently told me they did not use technology in their classroom. Taken aback I asked why. The teacher simply said they did not trust the technology and they did not want to look like a fool in front of the students. I think to myself; so you are are afraid to look human in front of students? As an administrator I need to provide support for teachers to help them seamlessly integrate the tech into their instruction. We need to push them and provide them with the research based tools to make the integration successful. Tech is not a method or approach anymore than paper and pencil would be considered. Engaging students is difficult if we don't really know them (ability and learning style) and what interests them. There is no one magic silver bullet strategy if we don't know the kids. And that means taking risks as teachers - sharing our failures as learning lessons, modeling that we are learners as well as teachers and taking risks. Technology is not to blame - it may sometimes help to engage but it can also help to distract. We can be good teachers with or without technology - we just need to define good teaching. I think it is the lack of knowledge of teachers on how to use technology that is the problem and their unwillingness to learn it thinking it will all go away. I use technology in my classes everyday with gen ed kids and ELL kids, my students are comfortable with the technology because that is their world. Well, as a parent and someone who's back in school to become a teacher, I find that fostering critical thinking skills is way more important than having them memorizing. Once they are given a good foundation with critical thinking skills they can then look at things with an abstract view which is lost when a child has to memorize something. If children does not have critical thinking tech can and will be a very dangerous tool. If a child understands that all things can be question in a rational manner, such as why, or what may make one article more credible then the other on the same subject, yet different view, then and only then will tech reach it's fullest potential in the school system. We need to educate parents, school boards and administrators on how the new technology can be used effectively in classrooms. Schools of Education have to train and model their students in the proper use of technology in all subject areas. Technology needs to be infused in all subject areas across all grade levels. Each school should have a technology leader who can model and show teachers how to get the best use of the new technology that is available to them. Students should be used to help promote the use of technology and in many cases they are more versed than their teachers. There were more great comments and you can read them here. It is so frustrating to me when I have a very qualified teacher, who understands student learning, who understands that we need to be integrating technology in the classroom, that refuses to use technology in their classroom because they are scared. Granted, the use of technology can be scary. Smartboards, handhelds, Minis, Tablets, all these expensive hardware options placed in the hands of teachers can be overwhelming. But again, I ask, why are teachers afraid of looking human in front of their students? News Flash! Technology is going to fail you at some point. A website is not going to work. The You Tube video that worked yesterday is blocked today. You just cant get that Smartboard (or ActivBoard) to work the way it's supposed to. It's going to happen. And you know, that's alright! Is it ok that your students know more than you when it comes to technology? Heck yeah! That is a power that few have tapped into. I love it when I go into a class and I see a teacher who just can't remember how to pull up the drawing tools in Smart Notebook or how to get the laptop connected to the projector. Instead of just giving up or moving on (What does that teach kids anyway? ), he/she turns to the class and asks if anyone can figure it for them. I have never seen so many hands go up at once! Kids are eager to share what they know! Did the teacher really not remember where the tools were? Maybe? Only they know. The point is, all the kids know is they have the opportunity to teach the teacher. That is powerful! We need to harness that and leverage it to our advantage as educators. One of the other underlying problems that was exposed last night was it is not the fault of the teacher. The fault goes higher than that. Some administrators do not foster an environment where technology is a key component. Some administrators are willing to buy the technology and put it in the hands of the teachers but are unwilling or unable to provide the time to train in their use. I agree, those are big problems, sometimes the direct fault of the local administrator, sometimes not. The point of all this is, lets stop the blame all together. Teachers, stop blaming the technology and use it already! Administrators, its time to provide support to the teachers so they can feel comfortable using these tools with their students. Blaming is not moving the conversation forward or changing anything for the better. 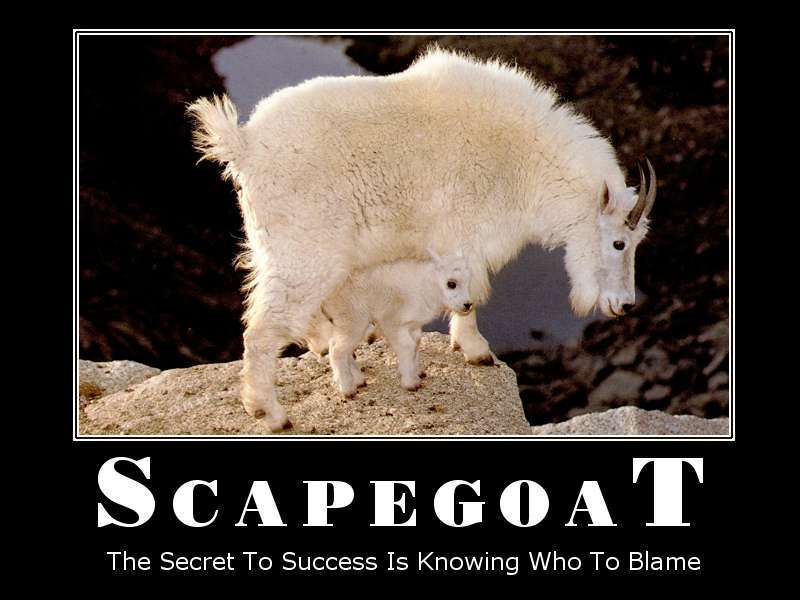 So instead of placing the blame somewhere else, lets all work together because its about the kids, isn't it? If you haven't heard, Google sent out the first of 100,000 invites to try out it's newest product, Google Wave. While I, and many, were not lucky enough to get an initial invite, we can still get an inside look as to what exactly Google Wave is and begin to think about how we can harness its power in the classroom. If you are one of the "chosen ones" and have access to Google Wave already, you can head to Google Wave Educators and connect with other users. There isn't a timetable yet as to when Google will allow more users but you can go to the invite page, put in your info, and cross your fingers. If you haven't heard by now, Animoto is one of the best photo/video mashup tools out there. (You can read some past posts I've done on it here.) In a nutshell, users can upload photos and videos, select some music to set the mood and create some of the most professional (and really cool looking) videos out there. What great tips! 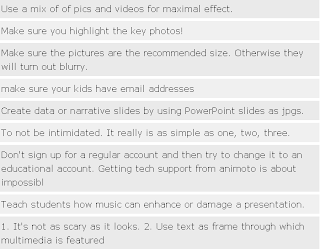 Remember, Animoto is free for Educators. Which means it will be free for your students to use. So head over there, sign up and get those creative juices flowing!